Robert Mugabe Resigns Under Pressure From Zimbabwe Lawmakers : The Two-Way The longtime president's own party made a motion to impeach him Tuesday. After 37 years in power, Robert Mugabe had faced unprecedented pressure to resign — pressure he ignored until now. Members of Zimbabwe's parliament celebrate after receiving news of Mugabe's resignation on Tuesday. Zimbabwe President Robert Mugabe has resigned from office, according to the speaker of the country's parliament. 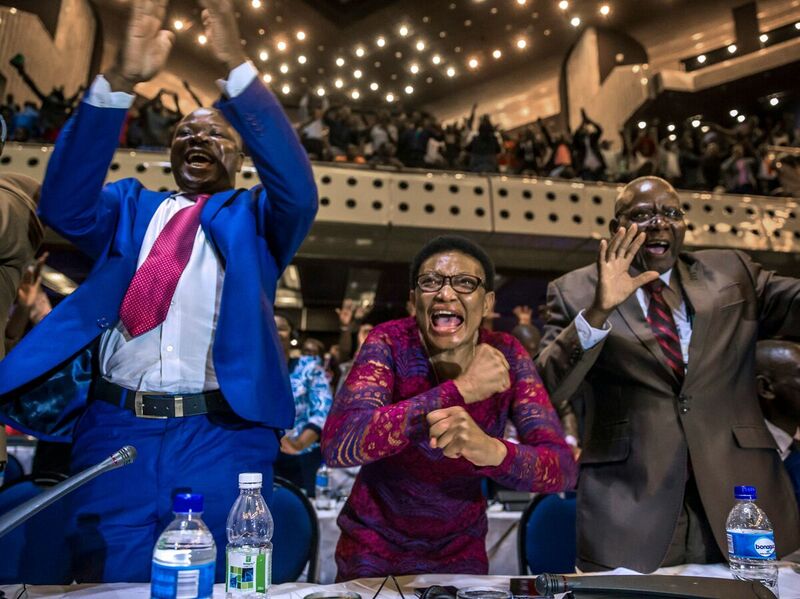 Midway through proceedings to impeach the president Tuesday, Speaker Jacob Mudenda read what he said was Mugabe's letter of resignation as the body of lawmakers erupted in jubilant applause. The resignation, which ends the tenure of one of the world's longest-ruling leaders, comes just one day after Mugabe, 93, ignored a deadline set by his own party to step down — and it follows a week in which Mugabe had been under house arrest by the military, which had seized power in what it described as a "bloodless correction." Crowds greeted the news Tuesday with celebrations and shouts of joy in the streets of the capital, Harare. Those celebrations were mirrored inside the parliament building, where politicians also loosed a raucous round of cheers. The apparent relief of many Zimbabweans caps six days of uncertainty in the country, in which Mugabe heard — and largely ignored — calls for his resignation from his own ruling ZANU-PF party and demonstrators in the streets. Then, the capper: On Sunday, even Mugabe's own ZANU-PF party voted to remove him and his wife, Grace, and appoint the recently ousted vice president, Emmerson Mnangagwa, as the head of the party in his stead. That's when the party issued its ultimatum: Step down, or you will be impeached. Mugabe's critics are "saying that Mugabe has brought economic despondency," NPR's Ofeibea Quist-Arcton told Morning Edition, "and also that he has allowed his wife, the first lady Grace Mugabe — who has unbridled political ambition and wanted to become vice president, we are told, and that is why he sacked one of his vice presidents — that he has allowed his wife to usurp power." But in a rambling televised speech later Sunday, Mugabe spoke of the economy, party rules — just about everything but the resignation many had expected. A party-set deadline to resign by midday Monday also came and went without definitive word from Mugabe. And as late as Tuesday morning, Mugabe even called a cabinet meeting — which most ministers apparently chose not to attend. In a statement from an undisclosed location Tuesday, Mnangagwa added his weight behind the pressure on Mugabe. Released before Mugabe's resignation, the statement called on the president to "accept the will of the people." "He's no savior. He's cut from the same cloth, the cloth that has seen Zimbabwe's economy tumble. This was the breadbasket of southern Africa. He's also seen as having been absolutely brutal in the '80s in Matabeleland when there was a massacre. So people shouldn't think of Emmerson Mnangagwa, who may come back and head an interim government, as being a savior for Zimbabwe — certainly not." "Zimbabweans I know — I'm Zimbabwean — we're ululating all around the world and we are celebrating," journalist Michelle Faul told Weekend All Things Considered, "but we need to be cautious. This is not a revolution to bring reform. This is about an internal ZANU-PF coup to ensure that ZANU continues its one-party rule of Zimbabwe." Still, these doubts have done little to dampen some Zimbabweans' euphoric mood Tuesday. "It's absolute total mayhem and hysteria," journalist Jeffrey Barbee, who is in Harare, told Morning Edition. "There are cheering soldiers, there are people hugging each other. There's — just everybody came out, crying. There are praises, there are prayers."